7th Pay Commission: Gratuity Ceiling To Leap From Rs 10 Lakh To Rs 20 Lakh The Union Cabinet on Tuesday approved an amendment Bill that seeks to double the gratuity ceiling to ₹20 lakh from ₹10 lakh for employees in the private and public sector, as well as autonomous organisations, brining it on a par with Central government employees. The Cabinet also gave its approval for introduction of the Payment of Gratuity (Amendment) Bill, 2017 in Parliament that seeks to amend the Payment of Gratuity Act, 1972, which applies to establishments employing 10 or more persons. 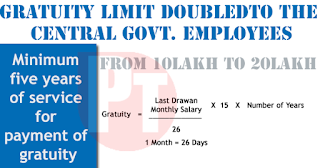 “The amendment will put the maximum limit of gratuity of employees of the private sector as well as public undertakings and autonomous organisations under the government who are not covered under Central Civil Services (Pension) Rules, at par with central government employees, which is ₹20 lakh,” an official release said. Before implementation of the 7th Central Pay Commission, the ceiling under Civil Services (Pension) Rules, 1972, was ₹10 lakh. “It is therefore proposed to empower the central government to enhance the period of existing twelve weeks to such period as may be notified by it,” the Statement said. With respect to gratuity, the amount is calculated on the basis of a formula which is 15 days of wages for each year of completed services, subject to the ceiling of Rs 10 lakh. This limit was fixed in 2010. Generally, the ceiling under the Act follows that of the Central Pay Commission recommendations. “Therefore, considering the inflation and wage increase even in case of employees engaged in private and public sector, the entitlement of gratuity is also required to be revised for employees who are covered under the Act. “It has also been proposed to empower the central government to notify the ceiling proposed, instead of amending the said Act, so that the limit can be revised from time to time keeping in view the increase in wage and inflation, and future Pay Commissions,” the Statement said.